great idea but I think its abit to hard for this idea. I think the breakthrough time should be a bit longer then you said... like 0.6 seconds is VERY fast so if you miss once meanwhile spamming the zombie can break through 1-2 layers, also the layering may be a bit much, Because it may be not that hard to get the webs, but trying to get a mob in a cocune might take about a 1/3 a stack of web balls, and so I think it will consume to many. I get your point and I agree but tone this down a bit cause it will consume lots of webs to do so even if the randomization of a web in 1.2.5 it still didn't consume that many webs. other then that something like this should be implemented. Oh yea, I remember the times I play this way back in 1.2.5 Good luck in the progress of the development! So we'll won't get attacked by golems? The webbing wasn't random. It was done by hp. Webs dealt damage & bounced off if the HP was high, if the hp was low enough, the mob got cocooned. I used to carry a sword with me and attack the mobs a bit before I webbed them to save webs. But that aside, I like your idea. also, I agree on the easy mobs thing. I never use armor or a sword stronger than stone unless I'm facing a boss mob, and you will not believe how easy it is to kill mobs. so cocooning should have a range decease(I think about snowball range would do fine) But the speed of web-breaking and the amount used to cocoon can be a lot lower. Like 7 for a zombie, and 3 seconds to break one layer of web. the time spent to break webs should multypliy with each layer. Ex 1 layer takes .8 sec to break 1 layer. 2 layers takes 1.3 sec to break 1 layer 3 layers takes 1.9 sec to break 1 layer. The break time should be low at first, but quickly climb as more layers are added. Spiderqueen walks into art-displaying place. "Hi, I want to give you this piece of art I made"
"oh what a beautiful peace of art! I'll put this in the main hall!" "oh my god! the spiders! they're eating me alive!!" well th thing about what you said about what darktemp said, well thats what i basicly ment. also again are the nether spiders i was talking about in some othr post goin to be in the beta release? It would need playtesting either way. Your way sounds way too easy to the point that you can just hold down right click and spam web to guarantee a capture. This mechanic was supposed to make that more difficult. Perhaps the difficulty could determine these variables. On hard, we have it my way. On easy, we have it yours. On Normal, it's somewhere in between. None-the-less, it's still a mechanic that should exist regardless of what variables we surmise are efficient when only thinking out loud with text and zero experience of how it actually performs in-game. Let's wait for like, 4 months, and see if a future version starts on this mechanic. speaking of webbing, I'd like the webbing to be more effective, but harder to get or something. I just don't want to have to spam a stack of webs, just to get a single zombie. I think what you have in mind can make webbing impractical for combat and just useful if you have a lone mob or something. well how long will it take for the release to be done? Cocooning is NOT intended for handling multiple mobs at once. It is for capturing a single mob as what you DO with said cocoon is turn it into a meal for you or your unborn broodlings. Cocooning isn't for combat. But even still, cocooning is only as much of a valid option with a group of mobs as a sword would be. With a sword, you can defend yourself but it's more dangerous. With cocooning, it's harder to focus on one mob, cocoon it, and move to the next while avoiding the other approaching mobs, but if you successfully cocoon all incoming mobs in a group, you get that much more meals. Both are a gamble. Cocooning doesn't NEED to be built around damage so as to appease players who think it is supposed to replace all types of offense, which it isn't. The reason I thought damage would be nice, is because I think it'd make more sense if you could cocoon a hurt mob more easily than a health mob, and I thought damage would be easier to do, rather than make the game keep track of how many times a mob was hit by a web. I never said that cocooning needs to be built around damage, and I never said it's for combat. Finding a lone mob is harder than you might think, and I'd prefer I can cocoon a zombie without having to deal with 2 skeletons and 3 other zombies with it. Besides, in the original mod, the cocooning was a way of combat, just as much as it was a way to get cocoons. Also, I the reason I think cocooning should be easier to a degree, is because if you make it as hard as you say, lots of unexpired players will have no choice but to carry around stacks upon stacks of webbing at spam them to have any hope of capturing. I want it so players could be more diverse, and make their own techniques for catching mobs and fighting, and I don't want sticking mobs in 1x1 holes to be the most effective way of cocooning mobs. They can use a web-only to capture mobs, or they can weaken the mob before catching to save up on webs, or they can use webs to weaken mobs and help them kill them easily. I thought making it use the mob health will be easier to program, so I put the idea out there. Plus, if you make the webbing deal damage, animals that get hit will run 'away' from you. even your method of cocooning can deal with large amounts of mobs with enough cocoons and distance. besides, I remember that eating 1 food gave you enough string for 1 webbing. If a zombie takes 14 cocoons to wrap, breaks webbing in .6 seconds, and aggros to you, I'm pretty sure that webbing travels around 5 blocks per second, so you'll need to be at least 4 blocks away from the zombie, have 14 webbing with you, plus at least 2~4 more in case you miss, just to catch 1 zombie. even if you wanted to nab an animal, it could take a long time with it running around. if you miss even once, you'll lose a layer of webbing. 1. enchantments. a webbing cannot be enchanted, which can put it at an disadvantage. 2. range. a webbing cannot match the range or accuracy of a bow. 4. usage. the most webbing you can carry in 1 stack is 64. that is less uses than even a gold sword. 6. inventory space. a cocoon takes up 1 whole slot, making cocooning mobs use up space faster than if you just killed it. there, 6 reasons why webbing can never replace all types of offence. While injuring a mob to make it easier to cocoon makes sense, you directly stated that you wanted webs to do damage. That IMPLIES it would be built around >damage< and thus more designed for combat. No, finding a lone mob is not harder than I think. I've played my fair share of a few hundred hours on Minecraft on Hard difficulty, and I am telling you that you are wrong. Finding a lone mob is not nearly as hard as you think. They do not travel in packs. even if you find three in the same general area, approaching just one will make it come after you, and thus deviate from its initial spawn-group. If you want to cocoon a zombie without dealing with other mobs, try some common strategy in Minecraft. I.E. don't try and cocoon a mob when it has surrounding teammates to attack you. Or, if you are so worried about this, play on Easy. Cocooning should not be constructed to make hard mode easier when dealing with mobs. And The Spider Queen Redux is NOT designed to perfectly mimic the old one by djoslin in 1.2.5. You seem to think that is some divine blueprint the coders are going to abide by. Uh, no. They are going to take what ideas they liked, and expand the mod in their image from there. It doesn't matter how it USED to work. It matters how it SHOULD work. This, of course, is a matter of opinion. Opinion that is up to the creative direction of the new mod developers. I'm not sure if you actually played the old version or not, but carrying around stacks of webbing is kinda what you WANTED to do. Having an over-abundance of webbing was very good. It meant you had lots of web-producing babies and a large nest. The reward for such a sizable nest was lots and lots of webbing. I like the idea very much that you have to start out slow and make your weballs count. I don't want to play a mod that is ideal for inexperienced players. Because then that means new players have LESS strive to BECOME experienced with the new mechanics. And with webbing and cocooning being such a unique and useful mechanic, it would be used all the time. The easier you make it for 'new players' the less fun it will be down the road when you have actually figured everything out about it. Cocooning should take skill so that it doesn't dry up and become a chore later in the game like it used to in THE OLD VERSION. New players will have no more trouble cocooning with a system of my difficulty than playing Minecraft on hard for the best experience. Besides, my idea was not completely fleshed out anyway. If it were to be implemented, I'd assume the game difficulty would actually determine cocooning variables. On easy, zombies take 6 weballs and break out of one layer every 1.5 seconds. On normal, zombies take 10 weballs and break out of one layer every 1.1 seconds. On Hard, zombies take 14 weballs and break out of one layer every 0.6 seconds, which would obviously be designed for experienced players who don't have issues with aim and never miss. And again, the devs are not just reviving the mod from its old ways. It is safe to say those were far from perfect and easily outdated at this point. They are REFLESHING the mod. It doesn't MATTER how cocooning used to be. That is NOT going to direct how it WILL be in this Redux. Also, your math makes zero sense. Assuming weballs do fly at exactly 5 blocks per second, that is not their maximum distance. You can be up to 10 blocks away and still hit a target. When the mob aggros toward you, it comes in a >straight line< which means you don't have to be very close to not miss. Once they come after you it is a shooting gallery. Also you built that figure based on an assumption that players would not move while cocooning. If you don't move while you cocoon a mob, it's bound to be harder, like you are trying to prove it already is. With animals, you are even more dead wrong. Animals break out of layers significantly slower. You can miss probably twice at average distance and still get a hit on the third fling without losing a layer. Plus you seemed to forget the feature that went along with my suggestion that the target moves slower with the more webbing it has on it. Chasing down animals that are going progressively slower would also be no more annoying than chasing down a chicken with a sword in vanilla Minecraft, which is slightly irritating but only because it is supposed to be, and is not an actual issue at all. 1: Weballs are very easy to get in mass once you have a built-up enough nest. 2: Enchanting might very well have a role in the future of this mod, so I'd hold your horses there. 3: Range of a weball and range of a bow are actually not nearly as different as you'd think. No one snipes with bows anymore. The average distance bows are used for, weballs can cover with ease. Accuracy is also never a problem. Weballs fly in the same direction every time. 4: Damage with weballs WILL replace all other weapons. Even if it only does a single heart, eventually, players will grow so vast in webbing that it is more ideal to use a renewable resource for infinite damage, such as weball spamming, than to go mining and craft an actual sword or bow. You are looking at how much damage weballs would do compared to weapons, but you are IGNORING how much easier it is to get lots and lots of weballs (which equates to lots and lots of dealable damage in your pocket at the ready at all times) than it is to get some weapons that have durability and can wear out because they are non-renewable and require either constant resources to keep strong through lots of battles, or will simply break and cost you more to make another. Efficiency is why weballs doing damage WILL replace all types of offense the player has accessible to them. 5: Usage with weballs is DESIGNED TO BE USED IN MASS! You aren't supposed to carry around a single stack of weballs. The more you have, the more power to you. And comparing it to a gold sword is also dumb because again, weballs should not be a better option for COMBAT than actual weaponry. You seem to want to relate cocooning back to defending yourself. I'm not sure you are understanding how this mechanic SHOULD be, and instead are focusing on how it was TRYING to be in 1.2.5. 6: Cocoons are not to be kept in your inventory. You cocoon a mob, or two, or a few, or 10. You go back to your nest, you place them there for later. They don't despawn or anything. You are applying vanilla Minecraft logic to a mod that will completely change how players play vanilla Minecraft in the first place. Cocoons are the base ingredient for expanding your nest, as you cannot get new types of spiders to be born into your brood without cocoons. It would make sense that something so crucial to expansion could not be stacked very much or at all for that matter. Players do not keep masses of cocoons in their inventory unless they are abusing cocooning, which can only be abused if it is more ideal for players than actual combat weaponry, which it would be if weballs did any damage at all what-so-ever. There, 7 reasons to dispel your six for why webbing actually CAN replace all types of offense in MULTIPLE ways if not done carefully SPECIFICALLY BECAUSE it is an incredibly expansive and useful and easy to learn and easy to spam mechanic. It is easily a core mechanic of The Spider Queen, and thus must be polished carefully so as to not negate anything else the player would otherwise use, such as weapons. I'm done discussing this with you for reasons that would make me appear very cynical and rude to share. Wow, I'm surprised at how much is actually done. Can't wait for the finished product. Also, I'm glad you are adding pet spiders, I hate spiders in real life, but I think they are adorable in Minecraft and very awesome. Keep up the good work! to be honest im not suprised at this. I get your point, and I must say, it is quite a good extremely argument you have. I just wanted webbing to have more uses than making webs and cocooning. But reading your points, I agree that making webbing too strong can lead to abuse. I did not think it should mimic the old mod, and I directly said I thought having it count health would be easier for the coders to code than having it count the number of times it got hit+low much it gets slowed down+struggle counter. note: I counted 5 reasons you put (#2 not counted), and I'm curios, what's your opinion about the lack of mob drops? will players be able to do without them? Whatever materials you need badly enough, you would typically be able to harvest from a mob spawner in a dungeon, as you being a spider, one would assume you spend most of your time underground and find spawners more frequently than in vanilla Minecraft where you just mine when you have to. But the main argument would be, nobody actually needs to go out looking for materials that badly. It hardly ever happens that someone has to go hunting down multiple mobs for specific supplies as very few mobs drop items exclusive to their death, like zombies with rotten meat. Nobody wants that stuff even in vanilla Minecraft. Whatever you need dropped from mobs you can craft or find elsewhere in dungeons to compensate. The necessity for mob drops when you are an cave-dwelling Spider Queen is significantly reduced when you think about it. Skeleton spawners can be found underground (which is where you will probably spend a vast majority of your time) in which you can harvest for arrows and bonemeal. Bonemeal is useful but not needed for growing food underground, and arrows are useless if you are favoring weballs instead of a bow in the first place in this hypothetical scenario. Materials dropped by mobs are too common to make the player go on a mob-drop looting spree. 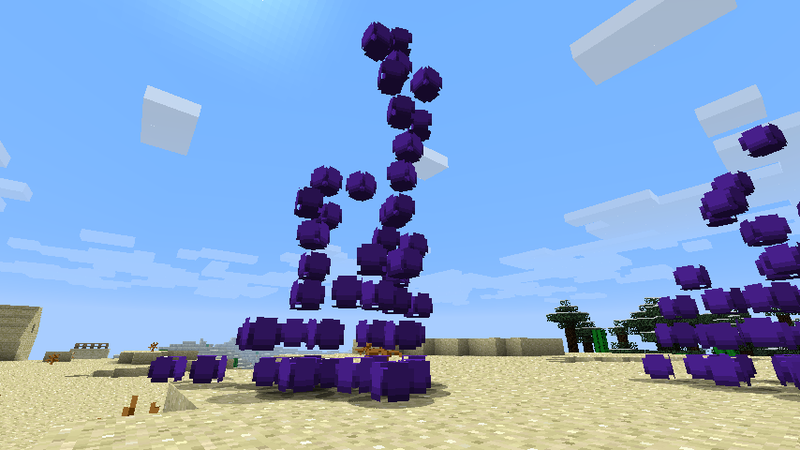 The only time weballs would be a bad idea is if you wanted ender pearls or what-not. Mob drops are less important to the player when they are a Spider Queen for a variety of reasons that would not even make it cross their mind that they would actually NEED what the mobs drop.